We already know that more content is coming to Animal Crossing: New Leaf, but tomorrow Nintendo will explain exactly what that content is via a special Nintendo Direct broadcast. The Animal Crossing Direct will be aired worldwide at 15:00 CET (2PM if you're in the UK). We'll be opening up a live chat page as usual, and you'll be able to watch the entire event on this very site. While the broadcast is expected to focus on New Leaf's amiibo connectivity, the Japanese version will also include a look at Miitopia, which is due out before the end of the year in that region. I keep forgetting about Miitopia, lol. Interested to see what that is. I'll be sure to catch up on the news and go on the game again, though Isabelle is gonna be mad at me for abandoning her. isabelle be throwing vases when you return, screaming "WHERE HAVE YOU BEEN?!?!'. also happy birthday to thomas whitehead. Miitopia sounds like something that requires eye surgery to fix. I'm picturing Miitopia as being a sort of cross between Animal Crossing and Tomodachi Life, so it would probably make sense to introduce it alongside talk about Animal Crossing in order to give it some context. 10am EST and 7 am PST. I remember the good old days when these directs used to be in the evening when I could watch them live. Are they still referring to it as a "Mini" Direct so we should expect it to be short? Is this only in Japanese or will there be subtitles or voice overs? Watched the MHXX Direct last week and it was hard to follow only in Japanese. will be watching this. I have been waiting to pick up new leaf again until this direct. glad it's tomorrow. Thought this might be coming soon. New Leaf was throwing messages about the server being down for infrastructure upgrades when I was trying to use some of the online features last night. @rjejr No, mini isn't in the title now, also it's a worldwide Animal Crossing Direct so I'd guess English voiceovers at the least. @Grumblevolcano Thanks grumble. I'll give it a go then and if it's any good I'll watch it again later with my kids. Animal Crossing Switch, let's go!!! Oh wait... that probably won't be announced so soon... well, a guy can dream. What time that will be on my teritory if UK at 2 P.M. ? Wanna watch the trailer LIVE. I'm sure I'll watch it but I'm not that excited for this one. I'm not a fan of the Animal Crossing series in general. I like the characters but I can't get into the game. I've tried, but every single time I try I feel like I just wasted my time doing absolutely nothing. Brilliant, I can't wait. I hope it's a new game or huge DLC to ACNL - not just Amiibo only stuff. That means I can watch it at 9 pm. 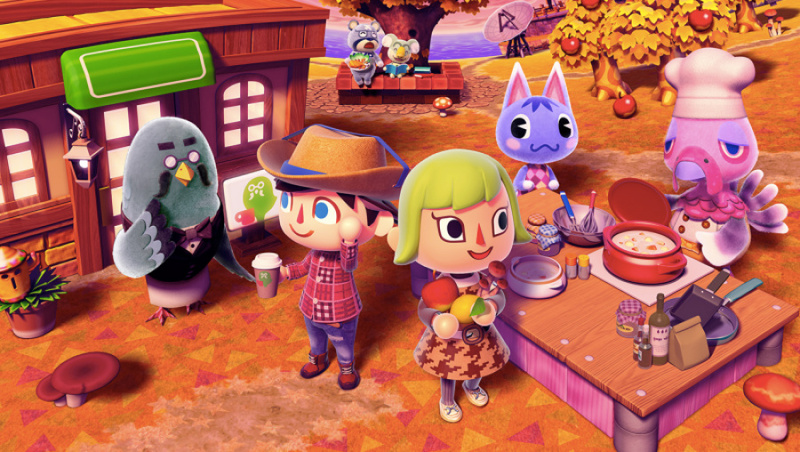 Imagine Animal Crossing New Leaf is like mini version of Harvest Moon ( You can pick fruits, flowers, fishing, swimming, diving, catching bugs,etc) and The Sims/MySims (You can decorate your house with furnitures, floor tile, wallpapers,etc). With online features so you can chatting with other players. To be honest, I was so skeptical 3 years ago before I owned Animal Crossing New Leaf due to disappointed experience from City Folk. But after I played for 1 week in a row, I was wrong to being skeptical. I started to get interested with ACNL and more hyped after playing for long time. Finally, my hype level is very high right now. I gave a score for ACNL = 8.5 from 10. With new updates + Amiibo cards = probably 9 from 10. That was the highest score and the Best Nintendo game that I ever have. Try it. I'm sure you will like it. At least you can do a lot of things than nothing on ACNL. @Anti-Matter I actually own a copy of both City Folk & New Leaf. I found City Folk to be terrible. I bought New Leaf because of all the good stuff others were saying about the game. I guess I don't care enough about decorating a house to motivate me to do all the menial stuff like collecting seashells bugs. But, I think this is awesome for all the AC fans out there. To get new content years after the game came out for free, is almost unheard of in the industry. Oh, wait. Miitopia first look ? Gosh, I forgot to read. Man...can't wait also for Miitopia. I'm anxious to see what the NPC amiibo do in the game. They've been collecting dust on my shelf lately. It'd be pretty cool if the content they unlock depends on their level in amiibo festival, then I'd actually play that game. I predict that this will become a full game on mobile. @Danrenfroe2016 Perhaps New Leaf will have some small connectivity with it. They could even tease the feature in the Direct. Are they never going to make a Nintendo direct on a weekend? what time will this play in EST times? I really wish a new Animal Crossing game would be announced instead of more updates to New Leaf. Don't get me wrong, I love New Leaf, I just want to see the next generation of this fantastic franchise. OMG that's 8am Central Time O_O I think. I stayed up so late playing Yo-Kai Watch last night that I didn't wake up until 8:30 this morning. Better go to bed a little earlier tonight so I'all be up in time. Animal Crossing has always been one of my favorite series. I can't wait for this. Looks like we'll be having something quick and easy for breakfast tomorrow. I hope the update goes live after the Direct. @Anti-Matter no problem bro! Woot! @Doggedfrog I think that is 9AM central. We haven't left DST yet. Shout out to my boy Apple ! Despite best efforts Curly, Bob and Mint have moved out this year. Everything crossed we can invite and allocate villagers. @Barbiegurl777 Restarting isn't hard. I did it on purpose in August and it goes a heck of a lot faster the second time. I need one more fashion check from Gracie and the fortune teller shop and my entire main street and all non-demolish-able building will be done, and my house is done. I've also almost finished the museum, though starting in August would have been better for that. I'm out of the loop here.... What is MiiTopia?